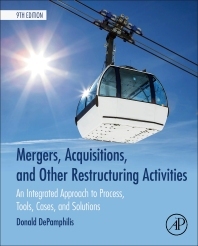 Mergers, Acquisitions, and Other Restructuring Activities: An Integrated Approach to Process, Tools, Cases, and Solutions, Ninth Edition, is the most current, comprehensive and cutting-edge text on M&A and corporate restructuring available. It includes many of the most up-to-date and notable deals and precedent setting judicial decisions, as well as new regulations, trends and tactics employed in M&As. The implications of recent developments such as negative interest rates on valuation and the backlash against globalization for cross-border M&As are discussed. More than 90% of the case studies are new for this edition, involving deals either announced or completed during the last several years. It is comprehensive in that nearly all aspects of M&As and corporate restructuring are explored from business plan development to target selection and valuation to negotiation and post-merger integration. It is cutting edge in that conclusions and insights are anchored by the most recent academic research, with references to more than 160 empirical studies published in leading peer-reviewed journals just since the release of the last edition in 2015.